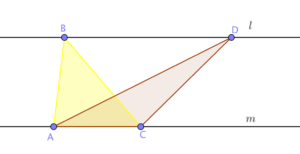 In Geometry, the term construction refers to the ‘drawing’ of geometric objects such as lines and circles with only the use of compass and straightedge. Construction does not allow measurement of both lengths and angles. The earliest study of Geometry, particularly parts of Euclid’s Elements focused on “building” Geometry based on compass and straightedge construction. In the following discussion, we will refer to compass and straightedge construction as simply construction. In the previous post, we have learned about line symmetry. In this post, we are going to learn about point symmetry, another type of symmetry. If a figure is rotated 180 degrees about a point and it coincides with its original position, then it is said that the figure has point symmetry. The point of rotation is called the point of symmetry.